The brand reveal event. hooray, confetti!! 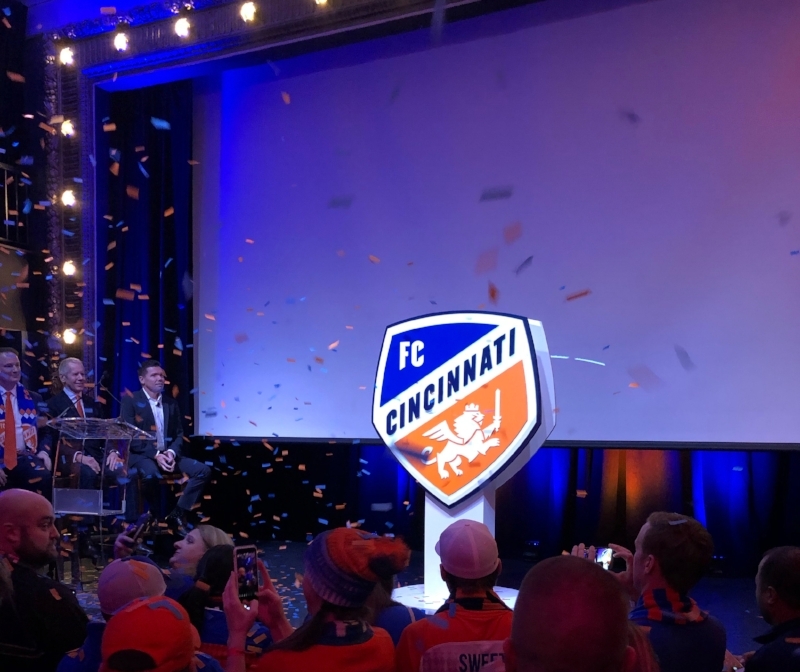 FC Cincinnati unveiled their new logo on Monday night at a ticketed, brand reveal event at the Woodward Theater in OTR. The event was simultaneously live-streamed on Facebook, YouTube, and Periscope. The logo was developed for the team’s move up to Major League Soccer in conjunction with the Cincinnati branch of the global marketing group Interbrand, who have worked with Juventus, the Winter Olympics, and established clients like P&G, Nissan, and ExxonMobil. The Brand is Life. Resistance is Futile. A brand release is not something people outside of board rooms usually get excited about. Adding a lowercase “i” with a cornflower blue flourish to the company logo is not exactly an answer to world hunger, or a definitive solution to the great debate surrounding the pronunciation of the word GIF. The branding of your favorite sports team, though, is very different. A new team logo is of grave importance to supporters. Fans like you and I wear FC Cincinnati’s logo over our hearts and on our heads. We fly it on flags as we march to the stadium on game day. We cover our cars (arguably the only objects of devotion in the American imagination more beloved than our teams) with stickers. We plaster the logo all over our social media and will perhaps someday soon even paint it directly on our bodies while wearing an orange and blue cowboy hat, a cape, and orange sunglasses on an overcast day. Whether it's a sharky dolphin on a field of shimmery teal and shiny melon, or a knifey lion named Gary*, fans will don their team’s logo with pride and reverence. Our teams' colors announce our membership in an exclusive club, our intention to defend its honor in heated debate. Fellow members are upstanding, right-thinking, friends-we-haven't-met-yet. Opposing members are dolts to be openly mocked for their bad taste and poor judgment. Branding is the rally symbol that unites us, says that we have chosen a side and that we’ve linked our own identity to it. So, you see, FCC unveiling a new logo was no simple marketing project. It was anticipated with the same smiling dread one feels when the boss announces, "big changes for the upcoming quarter." The zeitgeist among SG members was a healthy mix of “excited” and “please, don’t screw this up” (mostly the latter, if we’re being honest). *Editor’s note: It is apparent that the knifey lion logo has been playfully nicknamed “Gary” by some FC Cincinnati fans online. Whether it originated on Facebook or Reddit or some other social media forum, it is unclear to me. MLS Store Web Developer Goes to Lunch Mid-Design. FCC Fans Mobilize. 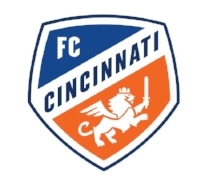 The FC Cincinnati MLS logo features a new, more nuanced take on the beloved knifey lion (Gary) in field of orange. “Cincinnati” rising from left to right up the middle of the crest is featured far more prominently than in previous iterations. The “FC” on the top of the crest in a field of blue is rendered in a modern, Germanic, custom font. The symbolic details of the stylized lion included a tail in the shape of the letter “C,” a mane with 7 points representing the Seven Hills, the lion’s back shaped like the Ohio River running through downtown Cincinnati, a crown representing the Queen City, and a sword for slicing up rivals who offend the Great and Noble Gary. Some fans liked it immediately. Others, not so much. Criticisms of “it’s not Cincinnati enough” were met with immediate rebuttals like “the word CINCINNATI in ALL CAPS is the biggest element of the design.” The colors were all wrong, there was a criminal lack of Bavarian diamonds, the crest shaped like a soccer ball panel was gauche and obvious. On the other hand, it looked sharp on the blue toboggan leaked on the MLS Store website and looked even better when photoshopped onto the chest of a reasonable approximation of an MLS jersey design. (I know, I know… kit design.) There were alternate versions, comparisons to other MLS crests, and of course the ubiquitous references to the clever use of negative space on the Hartford Whalers logo, etc. If there’s one thing we can all agree on, though, it’s Gary. We will chant his name, write him songs, adorn ourselves with his image, and petition the Cincinnati Zoo to name their next lion Gary, too. Everyone likes Gary. And, everyone who cares a lot, cares a lot about FCC. That really is the point of all of this. Everyone will come around. We’re all going to love it; if not for its clever design, or the way it captures the heart of the region, then for the simple reason that it represents something we love. For better or for worse, we’ve entangled our hearts and minds (and most Saturdays between March and October; and some Wednesdays, and the occasional Tuesday, because MLS schedule; and hopefully, maybe one or two Sundays in November, or perhaps even a Monday or Thursday? One can only hope) with a soccer team. By “we,” of course, I mean fans of FC Cincinnati. If you’re not a fan of FC Cincinnati, or of Cincinnati sports, or just a bored soccer fan with too much time on your hands, then it’s not likely you’re even reading this. So, if you’ve read this far, you proved my point. You just read (or casually scanned) a whole blog about a logo that you’ve already seen on a whole website dedicated to fans of a soccer team, because one way or the other, there’s more to the story of this logo than marketing. **Editor’s note again: Gary is not real and will not actually cut you. But we’re going to have words, that much is certain.